More than 25 years have passed since Jared Harper's pioneer work on Raton Pass was first published. This is a second edition of this important work, not only to bring it up to date, and to take advantage of recent trends in photo restoration and printing technology, but to expand on the original with the considerable amount of material that has come to light on the subject in the intervening years, especially on the coal mining industry that surrounded the pass from the beginning through the middle 1950s. 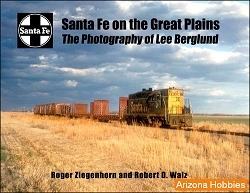 As the highest point on the vast Santa Fe Railway system, and possessing one of the steepest main line grades in the United States, Raton Pass attracted pioneer railroad photographers like Otto C. Perry, Richard Kindig, Jackson Thode, Les Logue, Clayton Tinkham, Joe Schick, and Preston George who documented the parade of trains over Raton Mountain in the 1930s, 1940s, and 1950s. 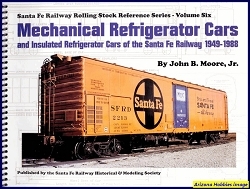 Raton was also noted for operating many more passenger trains and streamliners than freight trains, as an easier grade, via Amarillo, Texas, and Belen, New Mexico, was used by the majority of freight trains. Triple headers of steam engines were not uncommon. Freights usually had three or four engines on each train, a double header on the front end, and one or two pushers at the rear. Today the railroad is owned by the State of New Mexico and faces an uncertain future, but the history an operation of Santa Fe's line over Raton Mountain remains, and is indeed the stuff that legends are made of. 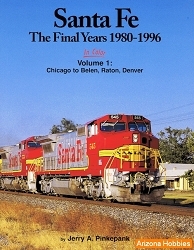 Santa Fe Railway H&MS, softcover, 160 pages, 11 x 8.5 x .5 in., 240 black & white and 10 color photographs, 9 timetable reproductions, 21 maps, 17 diagrams, Modeler's Notebook, Bibliography.